"FTP" stands for File Transfer Protocol and it is method by which files can be transferred from one host computer to another; over a TCP-based network like the Internet. In 3dcart's case, FTP access is used to transfer your image files, design templates and other site specific files to and from your store's server. 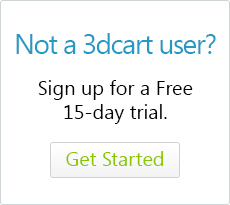 15-day trial versions of the 3dcart software do not allow for FTP access. To use FTP, the first thing you will need is an FTP client. This is a program that allows you to connect to a host server's FTP connection. There are many FTP programs to choose from and almost all of them are free of charge. However, when choosing an FTP client, please be sure to select one that allows for FTP over SSL (FTPS) as a a secure encryption option within its settings. The one we most often recommend is FileZilla. FileZilla is free of charge and has versions available for both PC and Mac. Furthermore, FileZilla contains an explicit FTP over TLS setting which allows it to connect to our newer servers which require FTPS encryption to connect. FileZilla may be downloaded here. Most FTP programs are set up in the same method, so when configuring your client, you will also need the following information. web/assets/images - This will contain all your product images and site files uploaded via the Online Store Manager's File manager. web/assets/exports - This folder will contain a cache of your store's various CSV exports from the Online Store manager. web/assets/templates - This folder will contain files pertaining to your installed theme templates. This folder will also contain the common templatefolder as described next. web/assets/templates/common - this folder contains all of the original - untouched - template files for 3dcart stores. This folder cannot be written to, but you can download templates from it for customization and editing purposes.